2 Alles klar Look over and know all of the Wortschatz on Seite 171 and 172. Look over the illustration found on Seite 145. 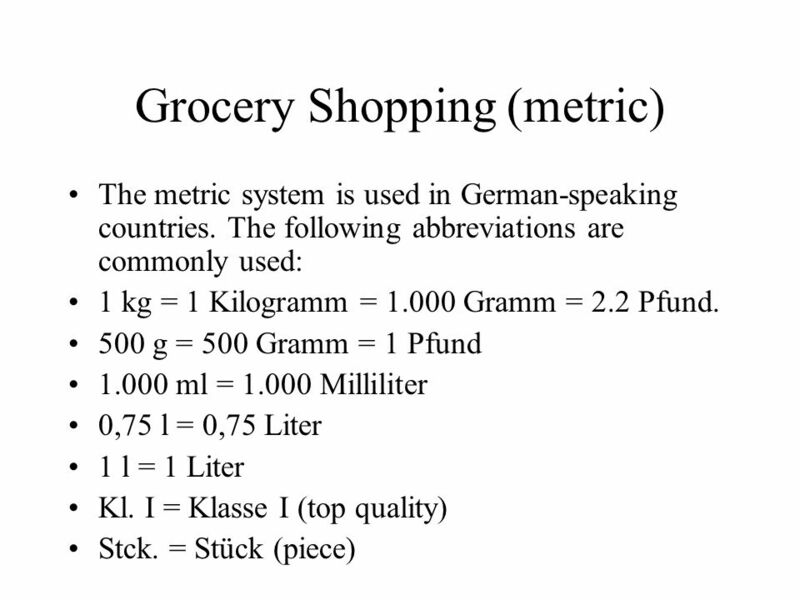 Become familiar with all of the items listed as well as words associated with a Kaufhaus. 3 Thema 1: Kleidungsstücke Look over Neue Wörter on Seite 146. Become familiar with all clothing items. 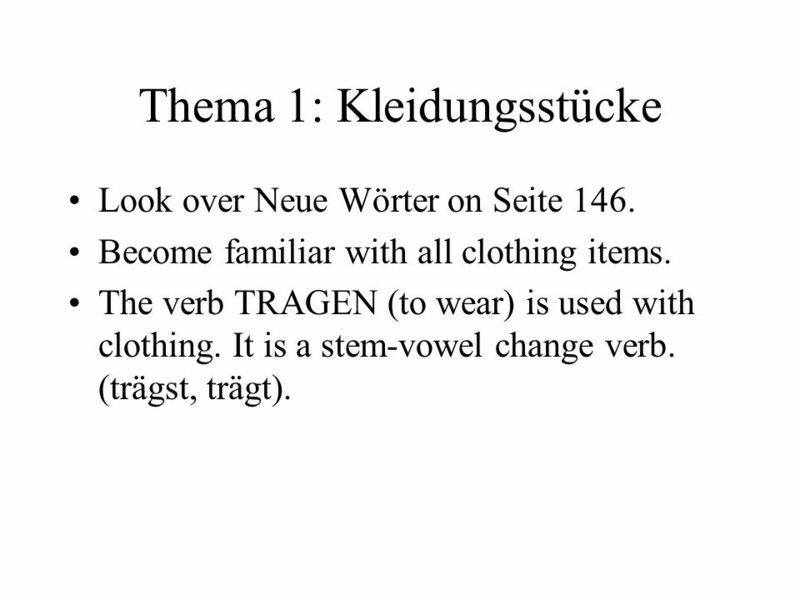 The verb TRAGEN (to wear) is used with clothing. It is a stem-vowel change verb. (trägst, trägt). 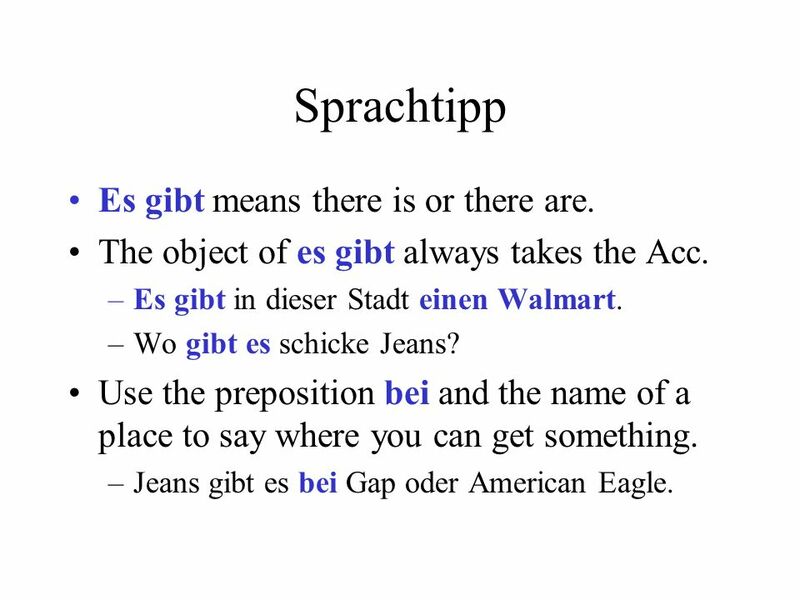 4 Sprachtipp Es gibt means there is or there are. The object of es gibt always takes the Acc. –Es gibt in dieser Stadt einen Walmart. –Wo gibt es schicke Jeans? Use the preposition bei and the name of a place to say where you can get something. –Jeans gibt es bei Gap oder American Eagle. 6 Thema 2: Beim Einkaufen im Kaufhaus Look over the Neue Wörter on Seite 149. 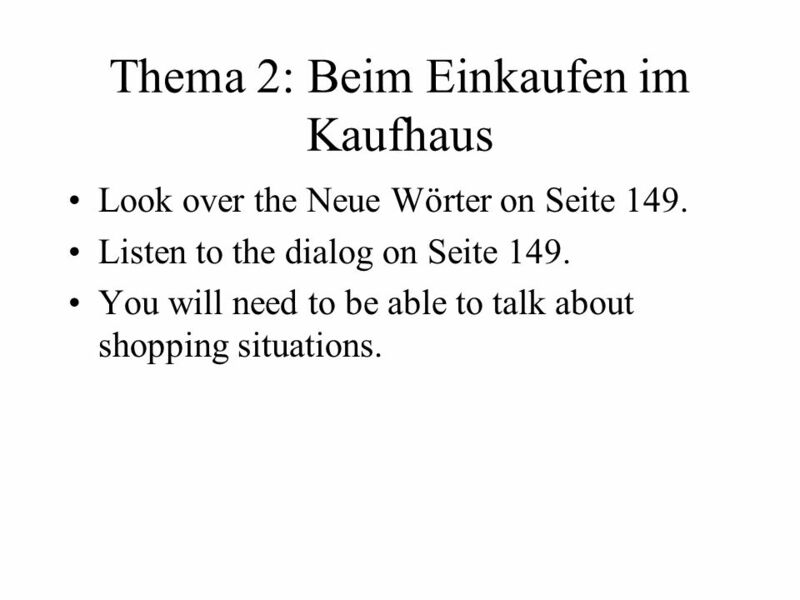 Listen to the dialog on Seite 149. You will need to be able to talk about shopping situations. 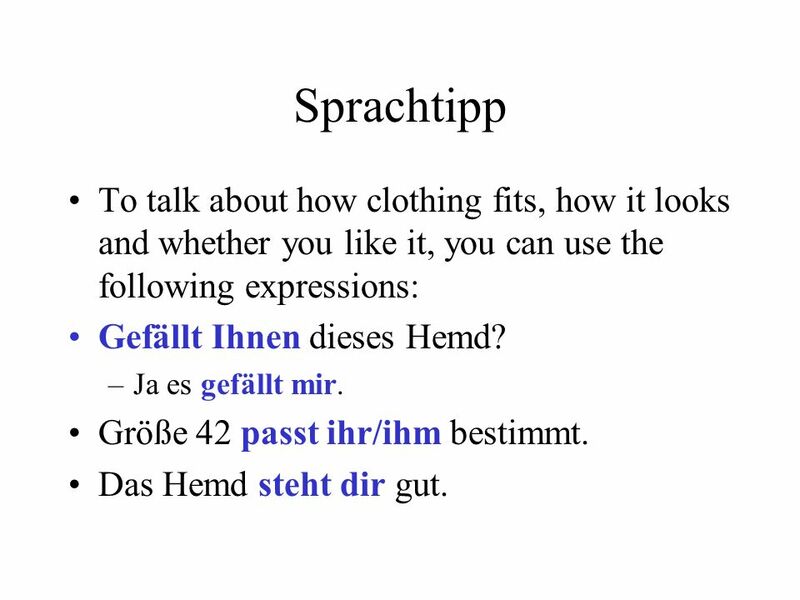 7 Sprachtipp To talk about how clothing fits, how it looks and whether you like it, you can use the following expressions: Gefällt Ihnen dieses Hemd? –Ja es gefällt mir. 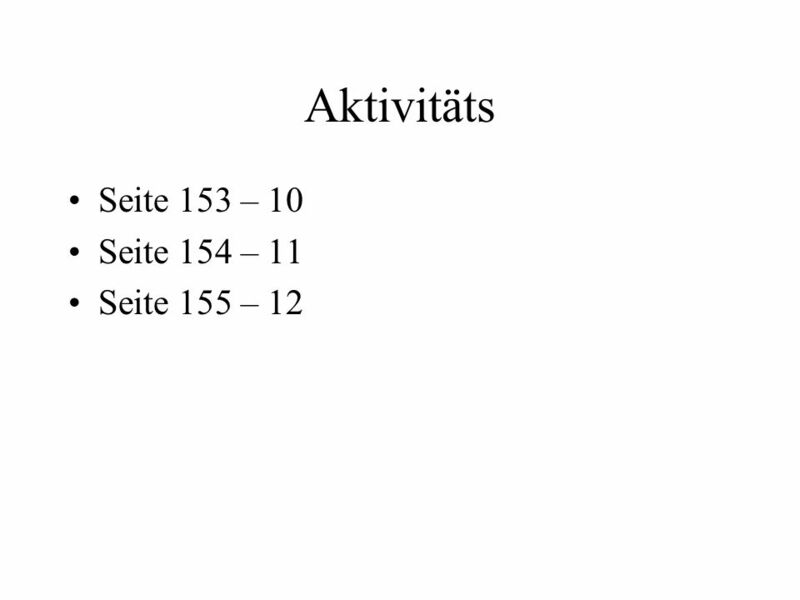 Größe 42 passt ihr/ihm bestimmt. Das Hemd steht dir gut. 9 Thema 3: Lebensmittel Look over the Neue Wörter on Seite 153. 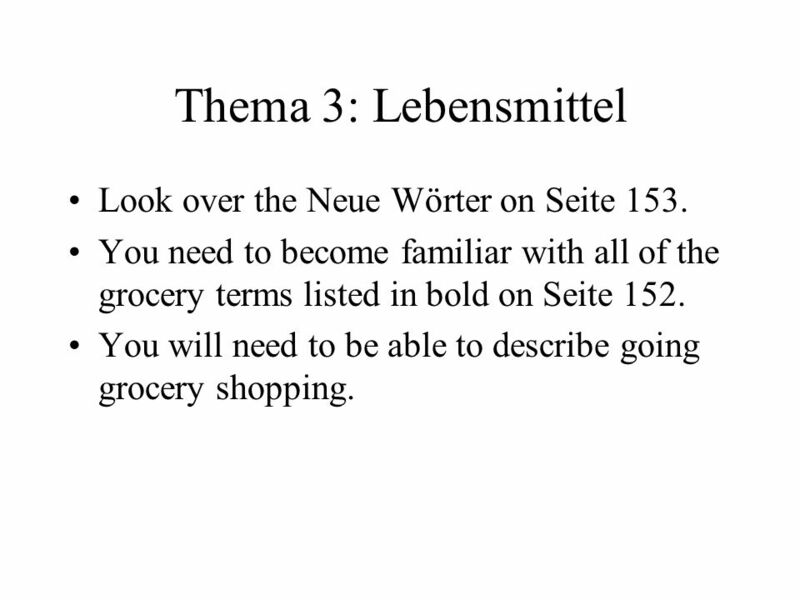 You need to become familiar with all of the grocery terms listed in bold on Seite 152. You will need to be able to describe going grocery shopping. 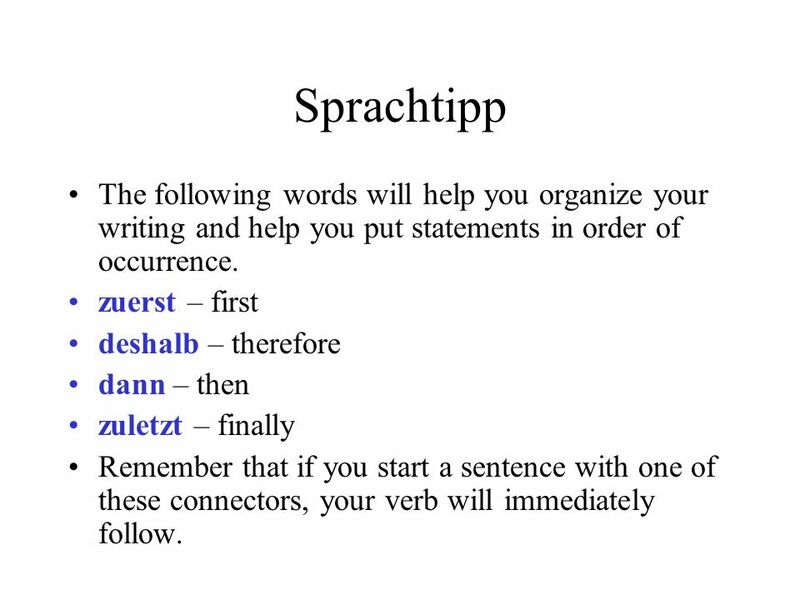 11 Sprachtipp The following words will help you organize your writing and help you put statements in order of occurrence. 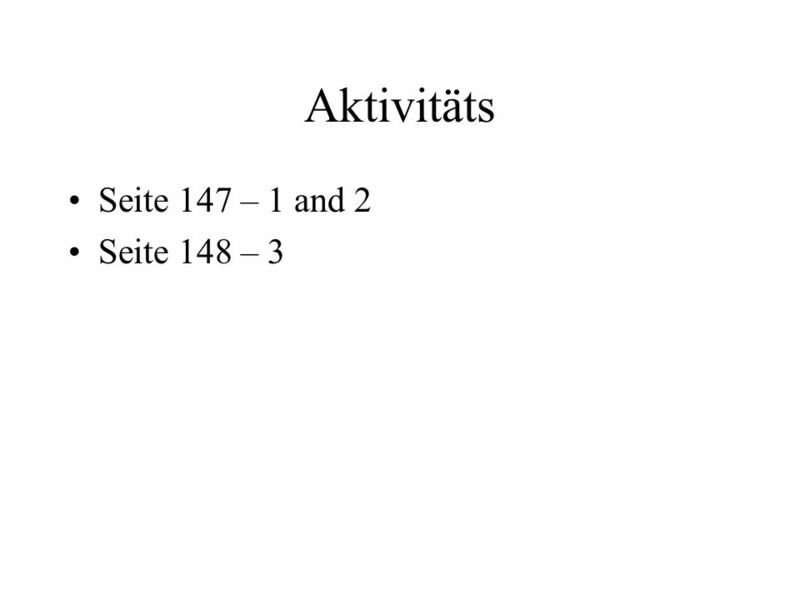 zuerst – first deshalb – therefore dann – then zuletzt – finally Remember that if you start a sentence with one of these connectors, your verb will immediately follow. 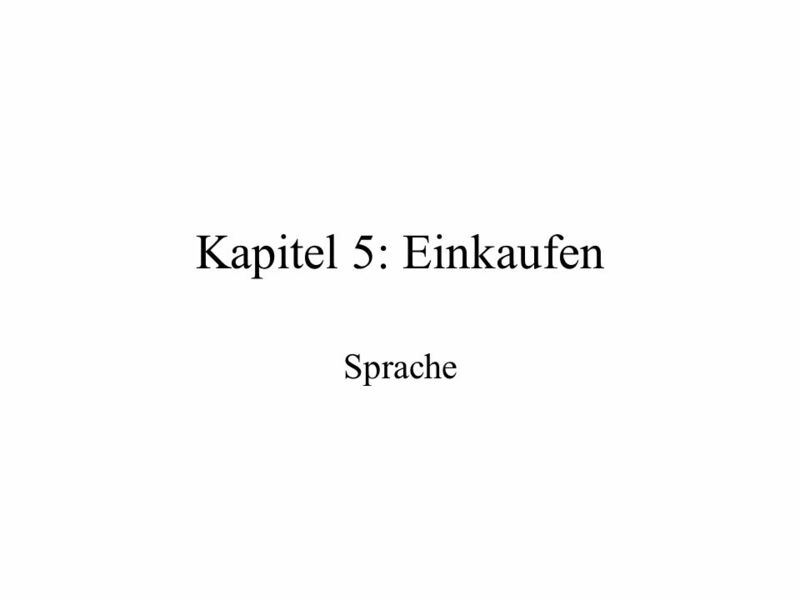 Herunterladen ppt "Kapitel 5: Einkaufen Sprache. 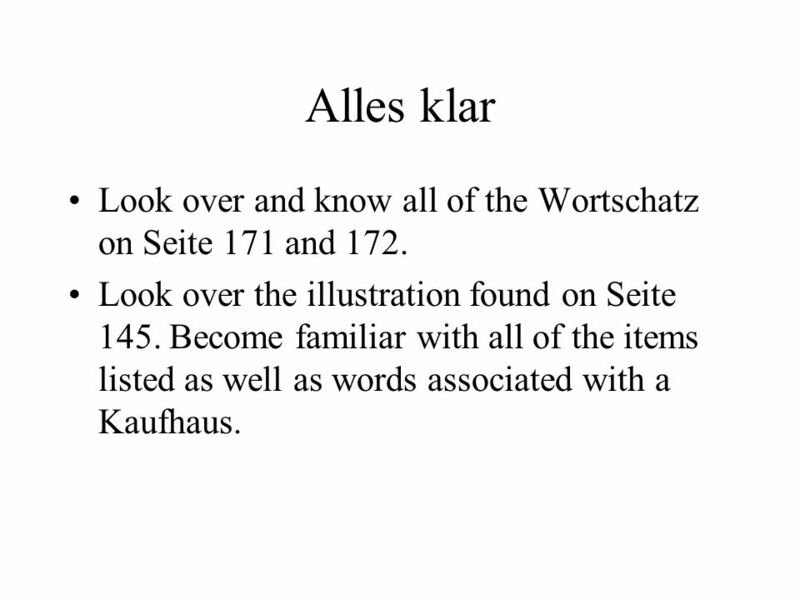 Alles klar Look over and know all of the Wortschatz on Seite 171 and 172. Look over the illustration found on Seite 145." Wie gefällt dir das? You will learn to: make suggestions ask about prices describe and choose clothing items write a letter and a card talk about a department. 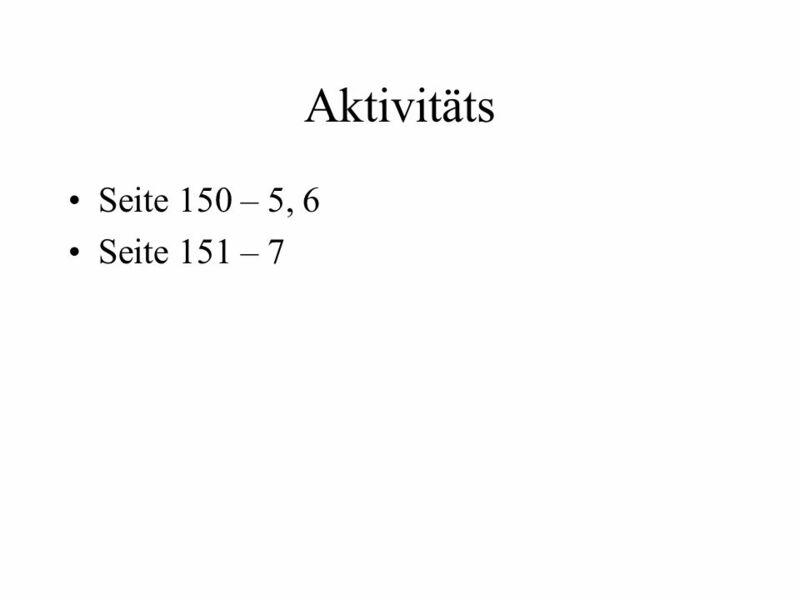 Chapter verbs… Deutsch I: Kapitel 7.